Because of our son’s allergies his choices for desserts are pretty limited. It’s difficult to find or make things that he likes. Not that I blame him, some of the things I’ve made are just disgusting. But when I do come across something that passes with flying colors I just HAVE to share it! 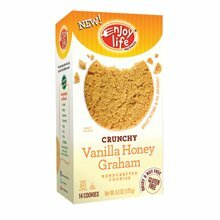 We recently got Enjoy Life crunchy cookies. Our allergy child loves their chewy chocolate chip cookies. So I was super excited to hear that they were coming out with a crunchy kind too. This was the ‘hidden ingredient’ in the new dessert. I find that the crunchy cookies do better in the blender then the soft ones. For this shake I used the Vanilla Honey Graham flavor. These cookies are super hard to find. I’m hoping more stores realize the need for allergy free foods. In the meantime, I will hound the store manager until he gives in. 🙂 Poor guy. I froze rice milk in ice cube trays overnight. I also keep a stocked ziplock bag of frozen bananas and purchased frozen fruits. Add one frozen banana, three frozen rice milk cubes, two vanilla honey graham crunchy cookies, and a bunch of frozen strawberries. I also add 2 Tablespoons of flax oil for added fat and nutrients. Then I pour enough rice milk in to come about a third of the way up to the fruit. Blend until creamy and smooth. Now you have yourself an allergy free dessert. You can add more milk and use a straw, or add less milk and create a frozen “ice cream” dessert that you can use with a spoon. It’s delicious either way and doesn’t take a lot of time to make. As with all the other shake recipes I’ve told you about. I usually make a BIG batch (once I know it’s a winner) and will pour some into popsicle molds, and others into ice cube trays that I put back into the freezer. I can pop the frozen dessert cubes back into the blender and create a dippin dot like consistency or add milk and make a shake. No matter the shape, it’s all delicious and so much healthier then traditional ice cream.